I.M.S. produces a range of competition filters designed to bring out the best in your coffee. The SHAPE and PERFORATION have been designed and calibrated so as to ensure the ideal extraction. 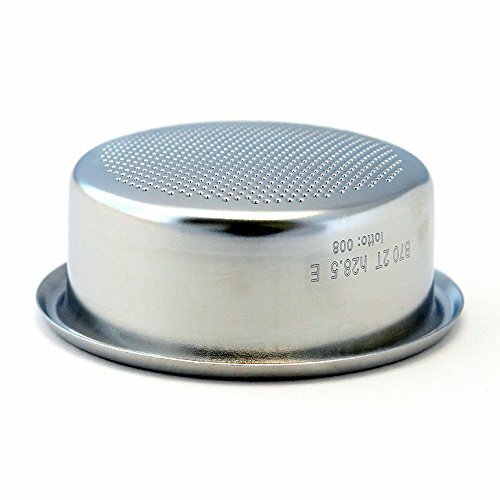 The recalibration of the perforation type means that there is uniformity in the diameter of the holes and the surface mirror finish facilitates cleaning of the filter. NOTE: Not all spouted portafilters are deep enough to allow for the use of this competition basket insert. If you are unsure of the portafilter depth compatibility we recommend using a bottomless portafilter or contacting the vendor from whom you purchased your machine. Shape: Border: Ø 70 mm (B70) | Height: 28.5 mm (H28.5) | Corpo: Ø 60 mm for Ø 58 mm tamper | Ridge: Ridgeless | Shape: Cylindrical with convex bottom |The shape was created by I.M.S. to obtain the proper ratio between the base and height of the coffee puck in relation to capacity. The filter is cylindrical with a specific corner rounding at the base. This shape has been designed to exploit the whole coffee puck, which also facilitates drying and expulsion.